For years, garlic meant pungent bulbs beneath papery sheaths. Actually, before that, garlic meant pulverized-into-pulp mush in a jar, the already-chopped garlic bulbs forced together to sit, waiting, for months, for someone to use them. Convenience dictated plopping a spoonful into my pasta, to yield taste, fast. My fingers never grew messy with the sticky juices of bulbs slithering down the knife blade, lending their particular scent to my hands and hair for days. I never touched garlic. The spoon dipped, the pan received, and I remained eye-smarting stench-free. It never felt right, somehow. Too antiseptic, too much like cheating. And when I realized just how old that browned garlic in a jar really was, I gave it up for the real thing. Except I switched to the garlic press, which smashed the bulbs for me, and only required a quick scrape of a paring knife, and into the pan. I ran hot water over the withered remnants of the skin inside the press, so by the time I touched it, nothing of the smell remained on my fingers. However, the paste that stayed in my food reeked of garlic with a capital G. I didnt know for years that pressing the garlic releases juices that intensify the silent-but-deadly scent that drives so many people away. Then I found the joy of pounding bulbs open with the flat edge of a large chefs knife. So what if my fingers stung with pungency and the board beneath took on a different color. It felt good to smack the heck out of that garlic, and then slice it, thin as I could, before sliding it into dishes. Much more subtle, much more satisfying. And then, last spring, I stumbled onto this: green garlic. These nascent bulbs, vivid magenta fading to white, are the immature starts of the storage bulbs that last all winter long. Pull them from the earth early, and you find these scraggly green stalks, like a stunted leek or scallions slightly askew. Chop them up like green onions and flick them into stir frys at the last moment. They make baked potatoes an even more perfect food. And since this vegetable is a sure sign of spring solidly here, green garlic seems to be close friends with fava beans and English peas. A few weeks ago, I had a cup of potato-leek soup with green garlic and tarragon oil at Crush, late at night. Im still thinking about it, figuring out how to make it. Best of all, green garlic is ephemeral, bound to disappear soon. 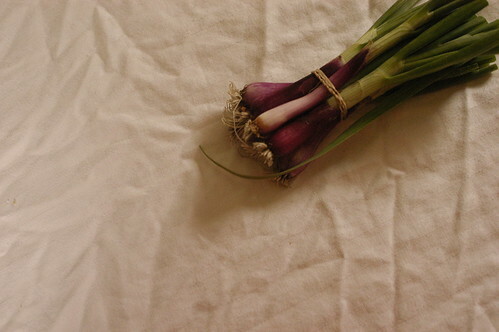 I like to eat it often, now, and then long for newly born garlic early next spring. So how about you? Have you discovered green garlic? And if so, how do you like to use this green, green vegetable? p.s. This morning, after I published this piece, someone alerted me to the fact that this week’s Sunday New York Times magazine published a musing on green garlic. I hadn’t read it, until now, but I certainly recommend it. That parsley-green garlic vinaigrette is going on grilled halibut tonight. I’ve never used green garlic before, but feel excited now because I have a small bit of space that I’m preparing this year for next year’s garden. I’d planned to grow garlic and now I’ll know to harvest a bit early! Garlic is like gold to me, and planting it in my garden each fall is the highest honor. This spring I have not planted spring vegetables because of other tasks at hand, but my garlic flourished anyway. I put in 268 bulbs last November, every single clove from 25 large heads I had saved from my June harvest. I felt rich then and especially now, with the long bed of tall green leaves waving in the air. I still have a couple heads of garlic left from last year’s harvest, but I prefer to walk out to the garlic bed and pull up one or two stalks of fresh green garlic. They are so valiant and beautiful! The insects stay away from them, as you might imagine, and the leaves haven’t yet begun to wilt or get too tough, so I finely slice the whole thing to add to salad, stir fry, soup, pesto, or anything else to which I would normally add green onion or garlic. In a few weeks the plants will send up their flower stems, called scapes or whistles, and those are yummy too, but maybe you’ll feature them later. Hooray for garlic: wonder food and garden gold! How do folks, Today I am cutting all the skates off of our garlic, about 1000 plants and I got to thinking about what to do with them besides what we have done in the past, I took out our juicer and I am grinding away, Getting some awesome juice, Has anyone ever done this. Peter. Nope, I haven’t heard of it. Maybe it will be at the farmer’s market out here in Virginia. I think I would like to use it to make “white pizza” gluten-free syle. Keep eating the garlic! It increases the blood flow from the mother to the fetus! I had garlic every single day during both pregnancies. I was in my forties when I had my second one, and my blood pressure was great. I admit that I only had garlic powder. We’ve been growing garlic for years. I can’t bring myself to pull out the young plants… it is worth all the months of watching them grow from one perfect clove into a huge bulb. But in late spring/early summer the garlic plants give you a little treat- garlic tops! They are green and they grow up and curve around. If you let them keep growing, they will flower. I cut them just before they grow a bigger flower head, and chop them and sauté them with other veggies. They are amazing with fresh corn kernels and morels. I’m sure green garlic would be great with corn and morels, too. But I’ll wait for the tops, not the bottoms. Nooo, haven’t tried green garlic, but I’d love to plant some of these in my back garden…can just anticipate green garlic in an asian pancake, or in an omelette…yums! Heh. I’m sitting here, smelling last night’s garlic on my fingers, thinking about how nice it would be to be rid of the pungent smell. I haven’t yet tried green garlic, but I will look for it next weekend at our farmer’s market. Hah what a coincidence. I was at my local farmer’s market on Sunday and while I’m not normally one to cave to peer pressure I saw a lot of people totating around these huge long (3+feet) green garlic plants. I found out they were selling for 1.00 so I bought one. I haven’t decided what do to with mine, but I’m thinking some kind of stirfry or rice noodle dish with pork. In less happy news the local stawberries were 6 bucks for a half pint and they didn’t taste that great either. le sigh. Must be patient for June. I just pulled some of this out of my garden this weekend- it is so good! BTW I’m sure you know this but just in case someone else doesn’t- rubbing your fingers along a bit of stainless steel such as the dull side of your knife or a sink bowl will remove the garlic smell from your fingers- try it it works! Green garlic in my country was a winter treat. We ate it like one would eat pickles… one-two spoonfuls per meal with our rotis and rice. We’d stir-fry it with some salt and ghee and it will usually last for 4-5 days in the fridge — just heat up to serve. Tastes great on bread too. Oh yea, oh yea, oh yea. Love green garlic. I like to slice it thin and garnish pasta or potatoes with it. Or add it to a frittata. I’ve also been adding chopped garlic scapes to just about anything that goes into the frying pan these days. My “garlic lady,” Yael, just sold me some young–not green, but not quite sheathed yet either–garlic last weekend that was to die for. I think people underestimate how lovely fresh garlic is at all stages, and the variations between the different varities. I know I did before I met Yael. i like to use it with asian fish dishes. steam a fillet of fish (try black cod)and just before serving, flash fry some slivered green garlic and ginger. plate the fish, pour the oil/garlic/ginger fry over the fish. delicious! i like serving it with lightly vinegared rice. maybe next year i’ll have a garden to plant garlic in…. Hope you and LB are in great health, as well as the chef. We (as in persians) have a traditional dish, which is rice mixed with some herbs (coriander, parsley, chives and dill, equal amounts of each, totally 1/3rd or 1/4th of rice), and we eat it alongside of fish. Green garlic can be added as another herb to this mixture. Also, as we steep rice usually (I mix rice with herbs, let it simmer until it’s not overcooked, yet not raw inside when you break one seed of rice. Then drain it, and then let it steam with the remaining wetness for about 15-20 minutes) green garlic stems (trimmed and washed) can be put on top of the rice when it’s steamed. It cooks and gives a wonderfull aroma to the rice, and then can be eaten too. I think you can also try it with plain rice. Cook it according to the instructions, while you are steaming it covered, put green garlic stems on top. When ready, enjoy the aromatic rice, the steamed green garlic, and try it with fish. It’s perfect. I’ve never used it before, but did find a week ago that I had lost a couple of cloves in my spice cabinet, which had sprouted. I was wondering if I stick those in flower pot if they will turn into green garlic. Right now the sprouts seem awfully dense. I almost cried last week when I got to the market and the person I always buy my green garlic from was out. It has been my favorite purchase this spring. I don’t know where in VA you live, but I’ve seen green garlic at both the courthouse farmer’s market, and if you are willing to go into the city, at Dupont. Wow! I’m sure this sounds so ignorant, but I had never seen green garlic until your post today. I always just thought it was the huge white bulbs one finds in the store. I reaaaaally love the taste of garlic in everything though, so knowing that the garlic press intensifies the taste makes me so happy. There is a dish I love that’s ridiculously simple, and it’s just a whole roasted chicken in a pan with a truckload of garlic cloves. I think the dish is actually called “40 clove chicken” or something like that….I always use more. I seriously eat the cloves whole once they’ve softened in the oven. I bet it would be really tasty with green garlic too. My husband likes to grow garlic and we have nearly a whole garden full of it. I had never considered eating it green. Neither did he, but he was really excited. Now I have a way to thin the garlic patch without throwing any of it away. I used it in a marinade for chicken (lemon juice, olive oil, green garlic, S & P). I wrote about it – unknowingly – last year when it was in season. In France, it’s called aillet and you can find it in all the markets in May. So I have cooked with it for a few years now, without ever being sure if it was a different species of garlic, or just young garlic! I just love it, so much more subtle and fresh than the old dried bulbs that are all you can find one short month before they come into season! Isn’t that funny? I had just recently read a recipe over at Simply Recipes that called for green garlic and I looked it up, not being familiar. Now, your entry and a news article to boot! Isn’t it funny how you see a new food and then it just pops up everywhere? I just read my local farmer’s market will be carrying some this weekend! I was in Boston last weekend, and found the area’s very first farmers’ market of the season in Cambridge. As it’s May, the market was tiny, but the one vegetable farm there was selling green garlic (along with barely pink rhubarb and tiny spring onions). I’ve been slicing green garlic (bought here, not in Cambridge) into thin rounds and tossing it into the roasting pan with asparagus and olive oil. Yum! I am in Northern VA, not too far from the Arlington Farmer’s Market at the courthouse. I just googled them, and their vendors look fantastic. Thanks for the info. Did you find it at a farmer’s market? I’ve seen garlic shoots (those green stalks curled at the tips–tasty) but never a garlic like in your photo. Sounds lovely! I find chopping garlic meditative. There’s a dish I love, pasta with broccoli and garlic. I saute about 6 or more cloves of chopped garlic in a good olive oil and sea salt and pour over the cooked pasta and broccoli. I leave out the pasta to serve it as a side dish. Serious garlicky yum. oof. that is one of my most favorite shauna photos yet. simple. gorgeous. painterly. striking. quiet. delicious. garlic no longer agrees with me but I can still appreciate its beauty.